Are you looking to improve your brand, or solely your social media strategy? Spying on your competitors is one method that some will raise their eyebrows hearing – but if it’s out there, it’s for you, right? You can gain a ton of valuable information by spying on your competition on social media. Insights, content inspiration, customer engagement strategy and much more. Social media hold quite a lot of information that you can learn from, so why not use it? In this article, we’ll tell you How To Spy on Your Competitors on Social Media in order to strengthen your own social media presence, but also how you can take advantage of what you learn, outside of social media. Who is your target audience – which platforms are they to be found? Choose platforms according as the demographics of social media platforms are different. What content do you want to share with your audience, and what feelings do you want to mediate with the visuals you share? How can you set up your social media profile in the best way? Doing the proper research before you begin working with social media will help you leverage many of your competitors, as many of them are doing this step wrong. A common mistake is first creating the social media accounts, sharing some pictures of their products (that isn’t thought-out), then beginning with their social media strategy. By having a different, and more effective approach to social media, you make sure that the foundation you build in the beginning is solid as rock. This will really help you when building your social media further on. While it is recommended that you avoid focusing on too much about follower count and how you can beat them in it, looking at your competitor’s follower amount and followers more deeply can give you a great understanding of your audience. Your competition people who are doing almost the same things as your business, but possibly with a slightly different strategy and approach. This means that even though your businesses are different in one way or another, you are still trying to reach customers in the same niche. For example, if you sell yellow tennis balls and your competitor sells pink, you are both still trying to target people who play tennis. Here’s the fun part. Knowing where your audience spends their time on social media, which platform etc. is difficult, and to find out, you need to do some proper research. Thankfully though, your competitors have most likely done this type of research, so by simply spying on them, you can save tons of time and effort. Find some of your main competitors’ social media accounts. If you don’t know where to start looking, try visiting their website. Most businesses have their social media listed with small icons on their website. If you don’t find their social media platforms on their website, try searching their name in Google, and there’s a big chance that their social media platforms will come up as results – if they have any that is. Now, you want to save the numbers you have found. Create a spreadsheet or write down the numbers you observed the good ol’ fashioned way with pen and paper. If you want to have more thorough statistics of your competitors social media pages, you can use SocialBlade. Socialblade lets you see the statistics of Instagram, YouTube and Twitter pages. You can also choose “compare with” to compare your competitors with another account. 1. Are your target audience to be found on social media? Although very unlikely, there are some target audience who are nowhere to be found on social media. These are often people from the older generation. If you couldn’t find any of your competitor’s social media pages, it might be an indication that your audience is non-existing on social media. Then, you need to reconsider the fact that your business should be on social media. If the scenario is different however, and your competitor has tons of followers, it might be an indication that your audience can actually be found on social media – and reached, with the right strategies. 2. Which platforms should you use? 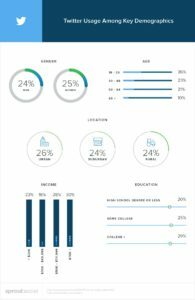 Many marketers and brands believe the more the better when it comes to social media platforms, but that is not always the case. There’s no point in registering for all of them and then posting average content once a week on them. In that case, it’s better to narrow it down to only a few platforms and then go all in on them. 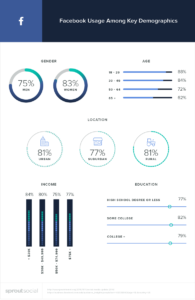 As we talked about before, the demographics on social media platforms look completely different, and you should be aware of that when you choose which to use. Spying on your competitors and seeing which platforms they have chosen will give you a bit of an indication but in this case, it’s better to do the research yourself. When you’ve begun with your social media and are now working to get traction or increase sales by finding your audience, your competitors can be extremely helpful because they have already gathered a ton of people in your niche around their account like a hub, so finding them won’t be that difficult. Go to your competitor’s social media account and take a look at their list of followers. If they have succeeded with building a strong social media presence, it should be long – and that’s good for you! You obviously want the people who are following your competitor to become aware of you, and there’s different approaches to that. Method 1 is to simply write them a personal message, letting them know about your brand. If you want, you can even give them a special discount code once you’ve chatted with them for some time to draw them to your website and increase the chances of them becoming customers of you. Method 2 means that you use a slightly different method of becoming noticed by the people who are following your competitor. Like a few pictures of their and leave a genuine comment. often, there’s no need for more than that. The most important think is that they become aware of your brand. One might say this is a very effective and simple way of brand-building. Method 3 is doing slightly more research. Go to some of the posts your competitors have made recently and read through all the comments. If you find a comment that screams unhappy customer, you might be able to steal that customer and give them a better customer experience with your company. The point is finding customers of your competitors’ who seems unsatisfied with what they’ve gotten or the service they have been treated with. This is because these are more likely to abandon the brand in exchange for something else. In this case – you. Creating high-quality content that is appealing to your audience is difficult on social media, but by spying on your competitors, it becomes slightly easier. Go to the profile of one of your competitor and scroll through the content they have posted. Could you recreate any of the posts they’ve made? By simply looking at the content your competitors share every now and then, you can get awesome ideas for your own page. The most important part however is not that you like the content you share on social media (even if that’s important), the most important part is that your audience likes it. So how can you know what your audience will know in advance? By looking at your competitors of course! Now, you don’t want to only be looking at the content, your competitors share but also the level of engagement it receives. Take a look at likes and comments. Once you’ve scrolled for a bit, you should have learned the average like/comment rate on each post they make. Was there any posts that stood out? Those posts with the highest engagement is the ones you want to recreate. Why? Because you and your competitors’ followers are very similar due to the fact that you are in the same niche. If their audience likes a pic of your competitor, there’s a large chance they’ll like a similar post on your account. Do they have an appealing visual appearance? For example a certain colour code or certain types of images being posted? When designing your different social media pages, you want to make sure that you have a consistent branding, so no matter what platform your customers find you on, it will be instantly recognizable. Looking at some of your competitors might give you some ideas on how you can achieve that. One brand that has succeeded very well with a consistent branding is Coca-Cola. It is very clear what colour they want you to associate with Coca-cola when visiting their social media pages, as almost all photos that are being posted includes the colour red. This one is quite tricky but with the help of your competitors, you can get a slightly better understanding. If your competitors have been in the social media industry for quite some time, they have probably figured out the ultimate amount of posts for them. This does not mean it is the ultimate amount of posts for you, but as you are so similar, it’s a good starting point. The best way is to see which of your competitors have the highest engagement. While this may not be the ultimate, most precise tool to see the best amount of posts, as there are so many other factors that matter here, but it’s a start. Now that you’ve set up your account properly and have laid the foundation for a good social media strategy, it’s time to start attracting customers and potential customers. As we all know, your competitors’ customers are your potential customers. So how can you attract them to your brand instead? Well, as we discussed earlier, engaging with them is a great way to make them aware of your brand, but the real challenge is actually finding your target audience. That’s when you turn to hashtags and check-ins. Most social media platforms have hashtags so you should be able to this on most of them. A lot of brands have their own branded hashtag that they encourage their customers/followers to use. Often, the hashtag is just the brand name but you’ll have to do a bit of research to find it. For larger brands, it’s easy to find different varieties of a branded hashtag, but they all have something in common. Those who are using it are customers or fans of the brand which means they can become customers of you. 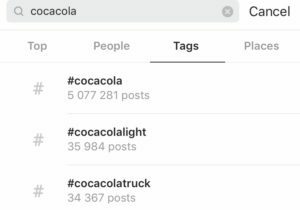 When searching for a popular branded hashtag such as Coca-cola, you’ll get tons of hashtag suggestions, all of which you can find people who are either customers or fans of Coca-Cola. 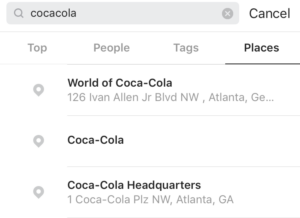 The same principle goes for check-ins but the difference here is that your competitor needs a physical location. If they don’t, you can skip this point. If they do however, this one is very effective as the people whoa are using it have been to their physical location which means you might be able to convert them to customers of you. Same thing here, a good strategy is to simply search for your competitor’s brand name and hopefully you’ll find something. Now that you’ve found your audience, engage with them, start talking and maybe, that will be the beginning on some very valuable relationships! Learning from others is a great way to set up and build a strong social media strategy that reaches your true target audience, and these tips are an essential part of it!